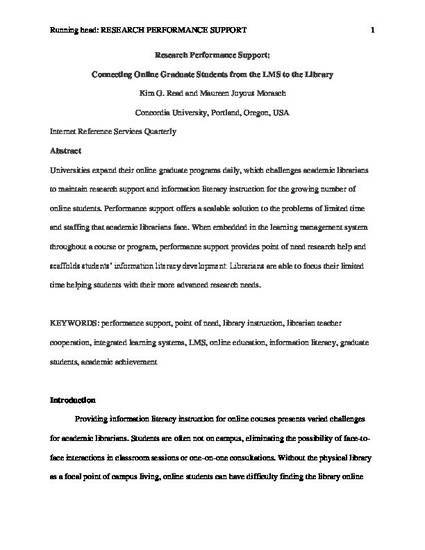 Universities expand their online graduate programs daily, which challenges academic librarians to maintain research support and information literacy instruction for the growing number of online students. Performance support offers a scalable solution to the problems of limited time and staffing that academic librarians face. When embedded in the learning management system throughout a course or program, performance support provides point of need research help and scaffolds students’ information literacy development. Librarians are able to focus their limited time helping students with their more advanced research needs.